Copyright: © 2016 Shah N, et al. This is an open-access article distributed under the terms of the Creative Commons Attribution License, which permits unrestricted use, distribution, and reproduction in any medium, provided the original author and source are credited. Adenosine deaminase deficiency is a type of severe combined immunodeficiency that involves about 15% of all SCID cases. This form of SCID has low B cells, T cells, and NK cells. This condition is complex with many possible complications including neurological abnormalities. Guillainbarré syndrome is an acute inflammatory disease of the peripheral nerves that involves an autoimmune attack on myelin resulting in demyelination. Chronic Inflammatory Demyelinating Polyneuropathy is a chronic form of Guillainbarré syndrome that presents with progressive symptoms. We describe a 14 year old female with ADA-SCID who developed chronic inflammatory polyneuropathy that did not respond to IVIG, or plasmapheresis or prednisone but successfully treated with rituximab. Chronic Inflammatory Demyelinating Polyneuropathy, responsive to anti-CD20 monoclonal antibody, should be added to neurological complications in ADA-SCID patients. Adenosine deaminase (ADA) deficiency is a type of severe combined immunodeficiency (SCID) that involves about 15% of all SCID cases . It is also the most common cause of autosomal recessive SCID . ADA works in the salvage pathway of purine synthesis and catalyses the reaction causing the deamination of adenosine to inosine and 2’-deoxy-adenosine to 2’deoxyinosine . If a person has a deficiency of this enzyme then it leads to the accumulation of deoxyadenosine and its precursor’s deoxyadenosine triphosphate and S-adenosyl homocysteine whose toxic effects can inhibit DNA synthesis . The incidence of ADA SCID is estimated to be between 1:375,000 and 1:660,000 live births . Various autoimmune complications have been reported in ADA SCID. They may manifest as autoimmune hypothyroidism, diabetes mellitus, hemolytic anemia, and immune thrombocytopenia [3,4]. Felgentreff et al. also reported that ADA SCID can be complicated by autoimmune cytopenia, autoimmune thyroiditis, lymphoproliferation, and skin or organ granulomas . Neurological abnormalities have been reported in 6 of 12 surviving patients (from a cohort of 15 who received HSCT) including mental retardation, motor dysfunction, and sensorineural hearing deficit . Tezcan et al. also reported ADA SCID patients with neurological complaints such as spasticity, head lag, and developmental delay in motor functions . Another report of three cases of ADA SCID with significant neurologic abnormalities, including head lag, hypotonia, and difficulty in focusing gaze, nystagmus, seizure disorder, and moderate-severe developmental delay were found to be mostly in association with infection or after bone marrow transplantation . Behaviour and cognition can be affected in kids with ADA SCID as well . Other serious complications such as malignancy (Burkitts lymphoma and cerebral lymphoma) have been associated with PEG ADA treatment [10,11]. Although chronic inflammatory demyelinating polyneuropathy (CIDP) has been reported in common variable immunodeficiency  and human immunodeficiency virus infection , CIDP in ADA SCID has not been reported. We report an Adolescent with ADA SCID on PEG ADA replacement that developed CIDP. A 14-year-old African American female with ADA-SCID on enzyme replacement therapy since age 4 months, presented to our hospital with one-day history of bilateral lower extremity tingling and numbness. While in the emergency room she had absent deep tendon reflexes (DTRs). Her circulating B cells were low (CD19+cells: 2%) (Table 1), as expected. A lumbar puncture revealed protein level of 292 mg/dL (Table 2), white blood cells of 2 m-3, and no red blood cells. ESR was 76 mm/hr. Imaging at time of admission included a CT of head without contrast that only revealed mild sphenoid and ethmoid sinus mucosal thickening, and a non-contrast MRI of head that was normal. She was admitted to our hospital but by the next day her weakness had progressed to involve her upper extremities and she was found to have signs of autonomic instability with increased breathlessness and variable blood pressure and heart rate (Blood pressure 119-136/85-106 and heart rate of 86-106). She was transferred to the intensive care unit and started on intravenous immunoglobulin (IVIG, 400 mg/kg daily for 5 days). This resulted in some mild transient improvement in her strength but reflexes continue to be absent. Her symptoms progressed to dysphagia requiring feeds via naso-gastric tube, and eventual gastromy tube. Table 1: Lymphocyte populations during the hospital course. Her ESR peaked at 102 mm/hr on her 10th day of admission, 5 days after her 5 doses of IVIG therapy (Figure 1). A nerve conduction study showed temporal dispersion, low amplitude, and reduced velocity in the range of 25-35 m/s. An electromyography revealed inadequate muscle activity in the left lower leg to account for her progressive weakness. Repeat lumbar puncture on the 19th day showed an increasing CSF protein (918 mg/dL) (Table 2). Oligoclonal bands were seen within the patient's CSF and serum isofocusing membranes. A serum ADA levels were within normal range (0.580 and 1.3 (reference range: 0.3-1.4 IU/g Hb, Quest lab). A Plasma ADA level was 20.53 (IU/L, Dr. Michael Hirshfield, Duke University, Durham, NC) which was similar to her previous levels. Plasmapheresis was started on the 22nd day of admission (every other day for 5 treatments). Table 2: CSF studies during the hospital course. 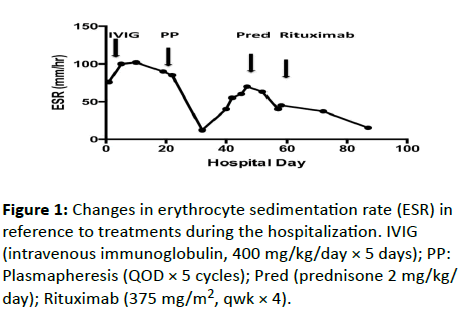 Figure 1: Changes in erythrocyte sedimentation rate (ESR) in reference to treatments during the hospitalization. IVIG (intravenous immunoglobulin, 400 mg/kg/day × 5 days); PP: Plasmapheresis (QOD × 5 cycles); Pred (prednisone 2 mg/kg/ day); Rituximab (375 mg/m2, qwk × 4). She had previously been found to have a liver mass during a prior hospitalization and an abdominal MRI revealed that her mass had significantly increased in size but CXR, LDH, AFP, uric acid, and serum HCG were all negative. On the 32nd day of admission her ESR had decreased to 10 mm/hr and her liver biopsy revealed a noncaseating granuloma with vasculitis. Silver and acid-fast stains were negative and she had no abnormal architecture. ANA, C3, CH50, ACE, C-ANCA and P-ANCA were negative. CT of chest was negative for lymphadenopathy or granulomatous calcifications but revealed ill-defined nodular opacities within the right upper lobe and left lower. Due to lack of improvement in 40 days in the hospital, she had bone marrow biopsy which did not reveal any neoplastic process. Numerous laboratory tests to exclude infections were negative except for positive urine histoplasma antigen (1.74 ng/ mL). A repeat test confirmed the positivity. A follow up MRI of her brain and spinal cord with contrast, on the 47th day of admission revealed “enhancement of trigeminal and occulomotor nerves and some facial nerves bilaterally” and “diffuse smooth enhancing thickening of the nerve roots of the cauda equina, including both dorsal and ventral nerve roots”. In addition to this finding the next day her ESR had also increased to 70 mm/hr (Figure 1). Lumbar puncture was performed: CSF protein had risen to 970 mg/dL (Table 2). Therefore, on day 48th of admission, she was started on prednisone 2 mg/kg/day for treatment of CIDP and liposomal amphoteracin B (5 mg/kg/day). Both CSF and blood fungal cultures obtained prior to amphotericin B therapy were negative at final readings. Even though her B cells were low, she had elevated immunoglobulins throughout the hospitalization. After a multispecialty conference on the 56th day of admission, the decision was made to start rituximab (375 mg/mtr2, qwk × 4) [14-16]. She was pre-treated with 50 mg Benadryl, 100 mg solumedrol IV, and 650 mg Tylenol 30 minutes before treatment. On the 60th day of admission, she gained full shoulder abduction and hips extension. One week later, after the second dose of rituximab, she was able to raise her arms over her head, use her hands, wiggle her toes, flex hips, and roll back and forth for the first time since the beginning of this illness. A day after her third dose of rituximab, she was able to take a few steps with assistance from physical therapist. Her post-rituximab B cells had decreased to <1% (Table 1). She was finally discharged to inpatient rehabilitation and then to home. A month after discharge, she was ambulating independently followed by a full recovery one year later. Classic CIDP is characterized by symmetrical weakness in both distal and proximal muscles that progressively increases for longer than two months, as opposed to self-limiting Guillain– Barré syndrome . The condition is associated with absent or diminished tendon reflexes, impaired sensation, an elevated cerebrospinal fluid (CSF) protein level, abnormal nerve-conduction studies (demyelinating), and if obtained, signs of demyelination in nerve-biopsy specimens . The pathogenesis is incompletely understood . The incidence of chronic inflammatory demyelinating polyneuropathy (CIDP) is 2-5 in 100,000 . When a patient develops chronic inflammatory demyelinating polyneuropathy early medical treatment is important for preventing loss of axons occurring as a secondary effect of the progressive demyelination . While multiple therapies have been studied, only a few treatments have shown proven benefit in randomized controlled clinical trials: corticosteroids, IVIG, and plasma exchange . However, approximately 25% of patient do not respond, or respond inadequately to these treatments . Rituximab, on the other hand, has been used with a favourable response in CIDP [15,16]. CIDP is not commonly reported as a complication of immunodeficiency except for common variable immunodeficiency  and HIV . Many Primary Immunodeficiencies have had autoimmune complications. Out of a cohort of 90 patients with SCID treated with hematopoietic stem cell transplantation (HSCT), 12 patients were reported to have autoimmune or inflammatory complications . Another report on a cohort of 74 SCID patients treated with HSCT showed similar rate of incidence of autoimmunity . In CVID, approximately 23% of patients have been reported to develop autoimmunity . Our patient clearly benefited from rituximab treatment although there are no randomized controlled trials favouring its use. All three of the above proven treatment modalities failed to maintain a sustained clinical benefit, until she was started on rituximab which decreased B cells to <1%. We conclude that CIDP can occur as a neurologic complication of ADA SCID and our patient was successfully treated with anti-CD20 monoclonal antibody rituximab. Buckley RH, Schiff RI, Schiff SE, Markert ML, Williams LW(1997) Human severe combined immunodeficiency: genetic, phenotypic, and functional diversity in one hundred eight infants. J Pediatr 130:378. Abbas AK, Andre HHL, Shiv P (2012)7th Ed, Saunders, Elsevier Inc.
Sauer AV, Brigida I, Carriglio N, Aiuti A (2012) Autoimmune dysregulation and purine metabolism in adenosine deaminase deficiency. Front Immunol 3:265. Notarangelo LD, Stoppoloni G, Toraldo R, Mazzolari E, Coletta A, et al. (1992) Insulin-dependent diabetes mellitus and severe atopic dermatitis in a child with adenosine deaminasedeficiency. Eur JPediatr 151: 811-814. Felgentreff K, Perez-Becker R, Speckmann C, Schwarz K, Kalwak K, et al. (2011) Clinical and immunological manifestations of patients with atypical severe combined immunodeficiency. ClinImmunol14:73-82. Hönig M, Albert MH, Schulz A, Sparber-Sauer M, Schütz C, et al.(2007). Patients with adenosine deaminase deficiency surviving after hematopoietic stem cell transplantation are at high risk of CNS complications. Blood 15: 3595-3602. Tezcan I, Ersoy F, Cağlar M, Sanal O, Kotiloğlu E, et al. (1995) A case of adenosine deaminase-negative severe combined immunodeficiency with neurological abnormalities. Turk J Pediatr 37:383-389. Nofech-Mozes Y, Blaser SI, Kobayashi J, Grunebaum E, Roifman CM (2007) Neurologic abnormalities in patients with adenosine deaminase deficiency. Pediatr Neurol37:218-221. Rogers MH, Lwin R, Fairbanks L, Gerritsen B, Gaspar HB (2001) Cognitive and behavioural abnormalities in adenosine deaminase deficient severe combined immunodeficiency. J Pediatr Jul139:44-50. Husain M, Grunebaum E, Naqvi A, Atkinson A, Ngan BY, et al. (2007) Burkitt's lymphoma in a patient with adenosine deaminase deficiency-severe combined immunodeficiency treated with polyethylene glycol-adenosinedeaminase. J Pediatr Jul 151:93-95. Kaufman DA, Hershfield MS, Bocchini JA, Moissidis IJ, Jeroudi M, et al. (2005) Cerebral lymphoma in an adenosine deaminase-deficient patient with severe combined immunodeficiency receiving polyethylene glycol-conjugated adenosine deaminase. Pediatr 116:876-879. Özdemir Ö, Okan MS, Kilic SS (2012) Chronic inflammatory demyelinating polyneuropathy in common variable immunodeficiency. PediatrNeurol 46:260-262. Cruz Martínez A, Rabano J, Villoslada C, Cabello A (1990) Chronic inflammatory demyelinating polyneuropathy as first manifestation of human immunodeficiency virus infection. ElectromyogrClinNeurophysiol30:379-83. Rajabally YA, Simpson BS, Beri S, Bankart J, Gosalakkal JA (2009) Epidemiologic variability of chronic inflammatory demyelinating polyneuropathy with different diagnostic criteria: study of a UK population. Muscle Nerve 39:432-438. Gorson KC (2012) An update on the management of chronic inflammatory demyelinating polyneuropathy. The AdvNeurolDisord 5: 359-373. Köller H, Kieseier BC, Jander S, Hartung HP (2005) Chronic inflammatory demyelinating polyneuropathy. N Engl J Med 352:1343-1356. Neven B, Leroy S, Decaluwe H, Le Deist F, Picard C, et al (2009) Long-term outcome after haematopoietic stem cell transplantation of a single-centre cohort of 90 patients with severe combined immunodeficiency: long-term outcome of HSCT in SCID. Blood 113: 4114-4124. Mazzolari E, de Martiis D, Forino C, Lanfranchi A, Giliani S, (2009) Single-center analysis of long-term outcome after hematopoietic cell transplantation in children with congenital severe T cell immunodeficiency. Immunol Res 44:4-17. Knight AK, Cunningham-Rundles C (2006) Inflammatory and autoimmune complications of common variable immune deficiency. Autoimmun Rev 5:156-159.